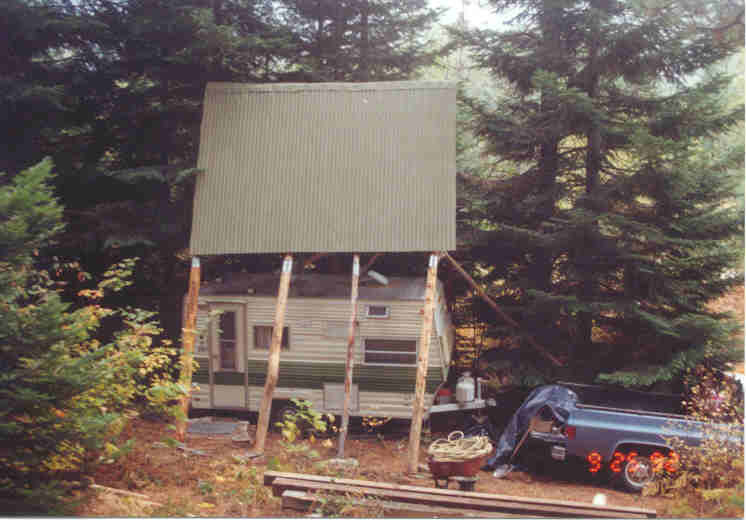 The major projects for 1992 were road building and installing the trailer with a protective roof. 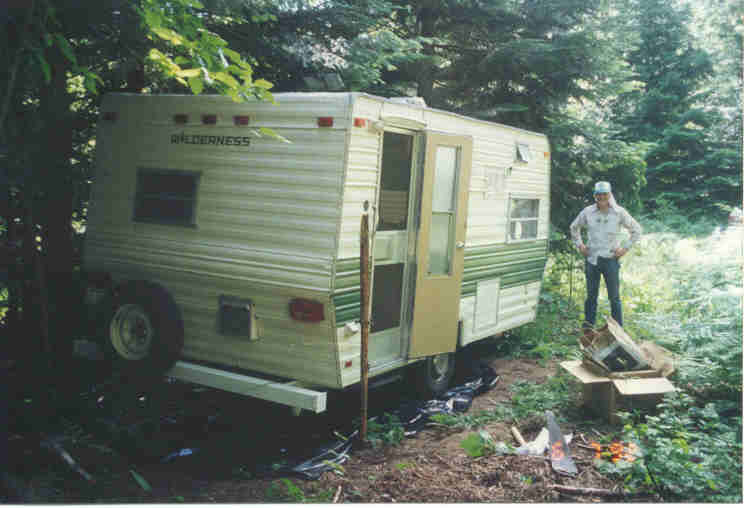 Here the trailer is in its final location. I have a handkerchief tucked in my hat to prevent sunburn. This is the start of bulding the snowshed roof over the trailer. 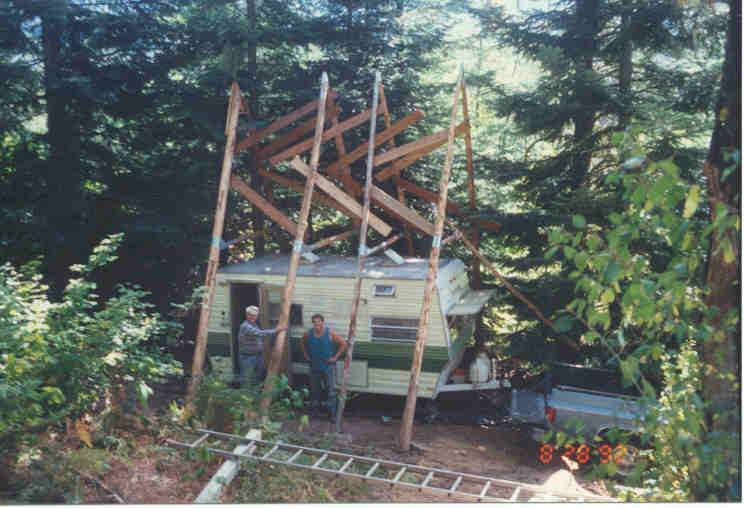 Each "A" frame was assembled on the ground and then lifted over the trailer using a crane I built. The crane boom is the 32 foot log seen going up to the right from my left shoulder. The boom is fastened to the bottom of the big tree right behind me. 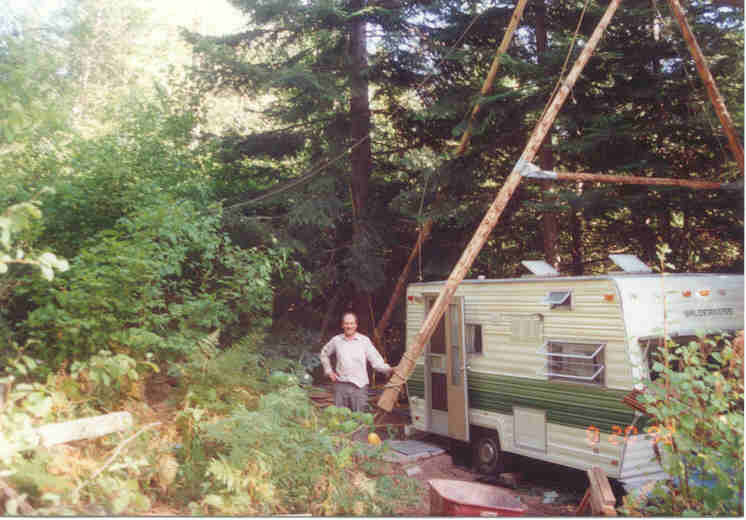 The top of the boom is fastened to a block and tackle attached 32 feet up in that tree. The "A" frame is dangling over the trailer hanging from the end of the boom. By carefully pulling and relaxing ropes, the "A" was moved to its position at the near end of the trailer. All four "A" frames are in place and braced, ready for the corrugated metal roofing. Bob Burton and Dave Martin helped me install the last two "A"s.
The corrugated metal is on. The ridge metal is on and painted. Its ready for snow. 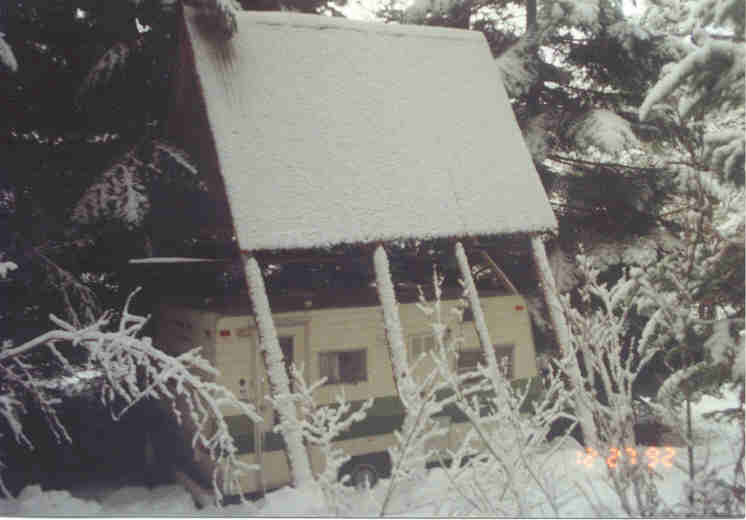 The first snow on the snowshed roof. 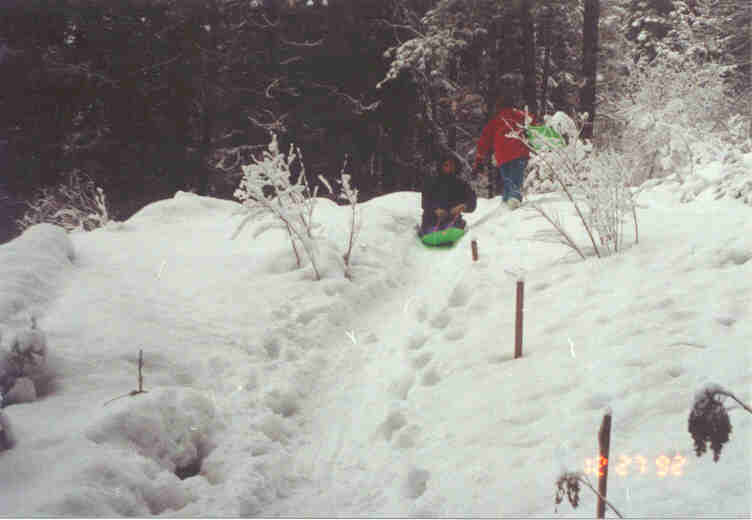 Ellen and kids sliding down the roadway past grade stakes. The building site is directly behind them. We spotted an animal crossing the road. 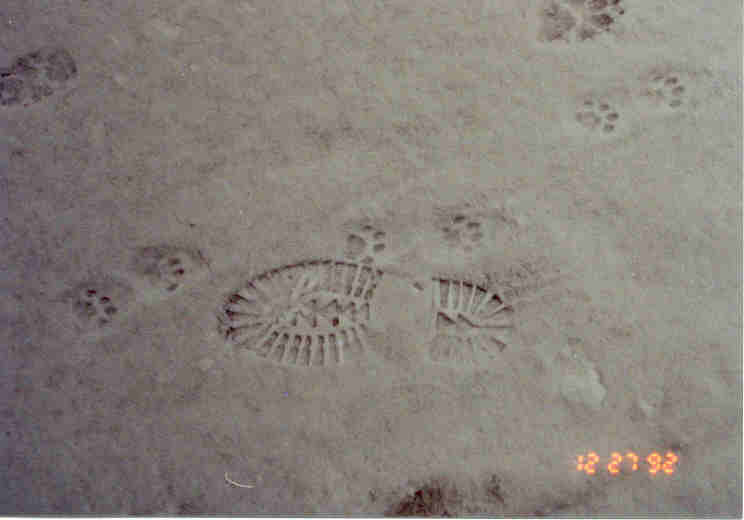 These are his tracks. 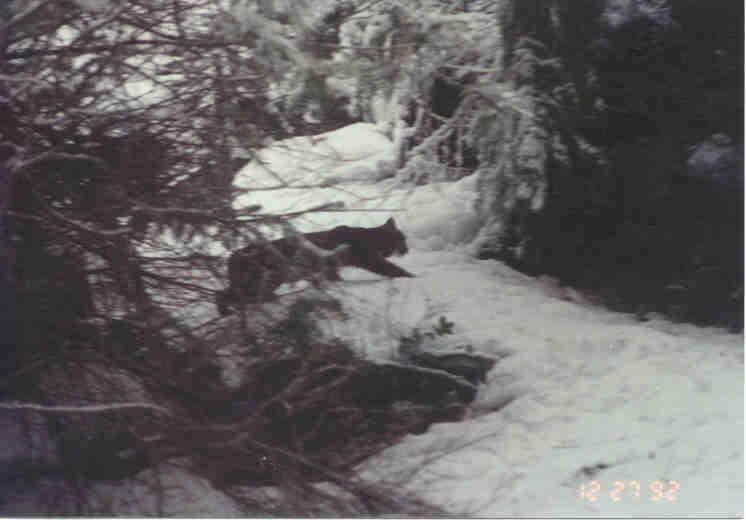 We looked up the hill and saw who made them: This bobcat.